The raised ranch style, also known as the split-foyer, is commonly found in older neighborhoods throughout Metro Atlanta. The raised ranch was a revolution of the simple one floor ranch house, and became extremely popular in the 1960s and 70s, with entire housing developments of split-foyer homes appearing throughout the US. Theory has it that the reason for raising the ranch was because as suburban families grew, they needed more floor space and more separation between children and adult activities at home. The raised ranch provided these features on a small lot, and was cost effective for both buyers and builders. Raised ranch style houses are built on a raised foundation and feature two stories with common qualities and characteristics. The raised ranch style home typically ranges from 1,300 – 1,600 square feet, which lends itself to being a more affordable option for first time home buyers or small families looking to move to the suburbs. It’s not ideal for people looking to avoid stairs, due to the multiple steps from the garage to the main living area. 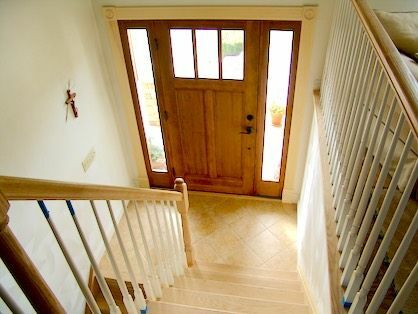 The entrance platform between the main and lower levels of the house is normally shortened, and there is no provision for an entry hall closet at this level. Renovations to a raised ranch can include revamping the two car garage into living space and extending a wing to the back with a new garage and a bonus room overhead. Others may choose to bump off the back of the house where the deck is situated to create another living area, which is more removed from the bedrooms. New windows, siding, and even a front porch can easily update the appearance of a raised ranch to give it a more contemporary look.